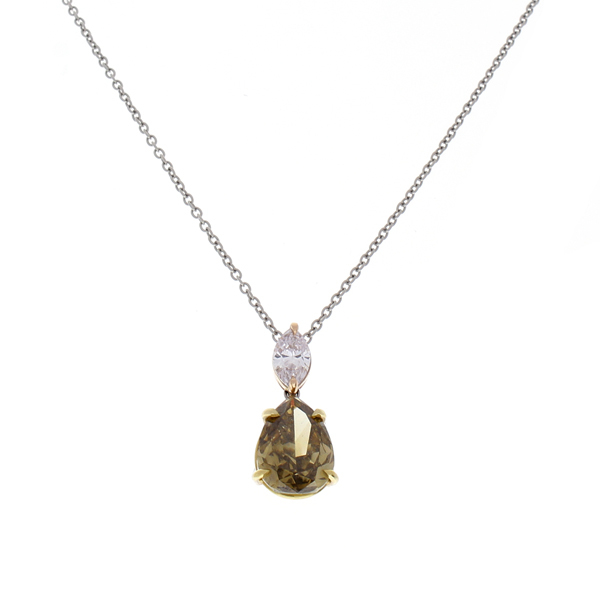 This necklace features one GIA certified pear shaped natural fancy dark brown-greenish-yellow diamond with a weight of 2.44 carats and SI2 clarity. The intense color of this diamond is complemented by a GIA certified marquise shaped natural light pink diamond with a weight of 0.42 carats and VS2 clarity (Gem Source: Australia). These beautifully paired diamonds are set on an 18-inch long glossy platinum delicate cable link chain. These shapes and colors work so well together. This necklace is accompanied by 2 GIA certifications upon purchase.